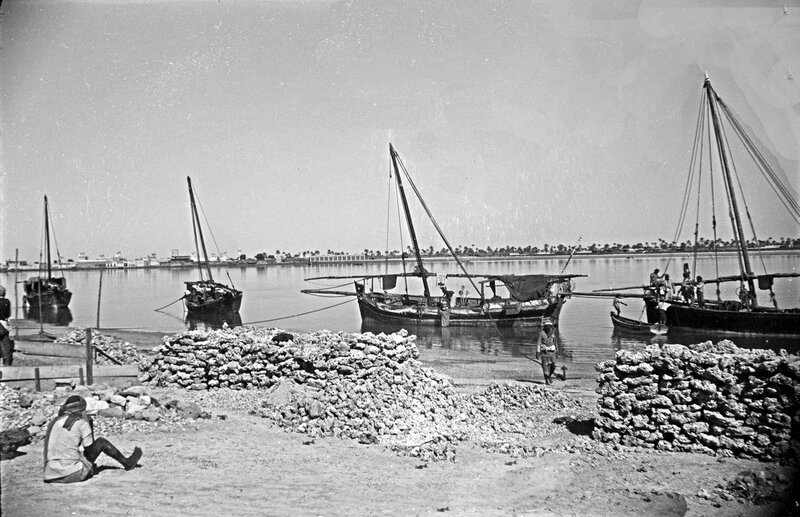 The seven emirates on the Arab shore of the Gulf were known in the eighteenth and early nineteenth centuries as the Pirate Coast, and later as the Trucial Coast as Britain and the emirates entered truces, or treaties, by which Britain progressively took responsibility for the their foreign relations and protection as a means of subduing piratical inclinations. The Foreign Office, which took over responsibility for Trucial Coast affairs from the Government of India in 1948, posted a permanent political agent to Sharjah in that year. Two years later, it transferred the agency to Dubai. The seven emirates, of which Abu Dhabi, Dubai and Sharjah are the largest three, formed the United Arab Emirates in 1971 when Britain completed its withdrawal of military forces from the Gulf. Abu Dhabi is the seat of the president and cabinet, and where the ambassador to the UAE resides: Dubai is the centre of commerce, and where the consul-general resides. The Foreign Office wrote to the Ministry of Works in June 1954 ‘Oil has been found in the Trucial Sheikhdoms of Abu Dhobi and if information is received that it is present in commercial quantities, it will probably be necessary for us to set up another Political Agent there without delay.’ Oil was indeed found, and an agency was established soon afterwards. In 1955, the Ruler gave the agency the chance to choose for itself any site that it wished on which to erect an agency building. The resultant choice was a site next to the sea and pegged out (250 x 210 ft., about 1¼ acres) by the political agent and William Bryant, senior architect in the Ministry of Works. Bryant enquired whether there would be any documents to confirm this transfer of land, and the agent thought it unlikely. Erecting a house was far from easy. Given that London had concluded that any building should be to an austere standard, importing prefabricated bungalows from Lebanon was considered but in the end Bryant designed a two-storey building with offices on the ground floor and a two-bedroom residence above. It was built by directly employed local labour and occupied in late 1956. There was already pressure for more accommodation, and two small houses were then built by the same works team. More accommodation was required by the late-1950s and that needed additional site area. London wanted to buy the necessary extra land, and not have it gifted, so that it could be sold at a future date. The agent of the day cautioned that no foreigner could sell the Ruler’s land, whatever the terms on which it was held. Accordingly, the agent asked the Ruler for ‘an extension of the present plot’ in April 1960 and was told that ‘It pleases us that you should include this increase in the area of the Political Agency and we wish you a happy residence in it.’ The extension, not least because it ran down to the low water mark on the west side, quadrupled the area of the compound. New single-storey offices (to a plan used at Enugu) and two new bungalows for second secretaries (to designs used at Freetown) were built by 1963, and the original agency building was converted to a two-storey residence. 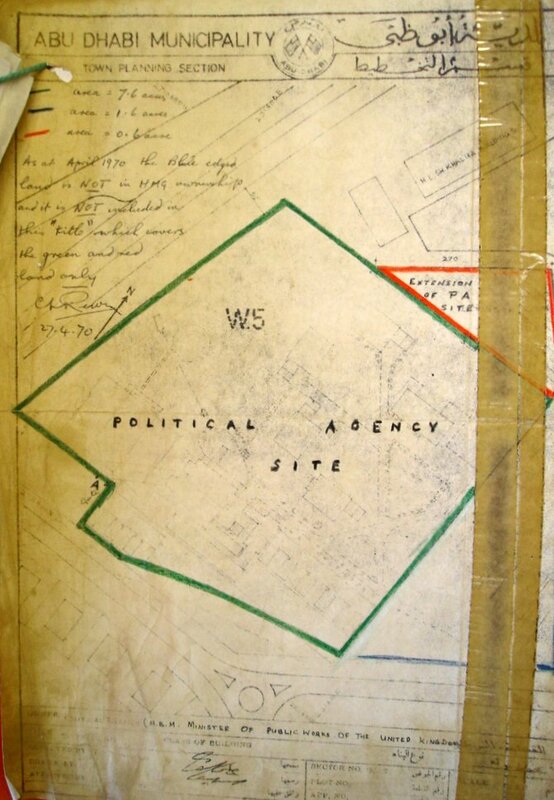 A little more land was sought and given in 1964 on the south side, on which were built three small houses for contract staff, and also a strip along the north boundary soon after. There was a scare in 1969 that the Post would have to move to a newly-designated diplomatic area but the Ruler set British minds at rest. 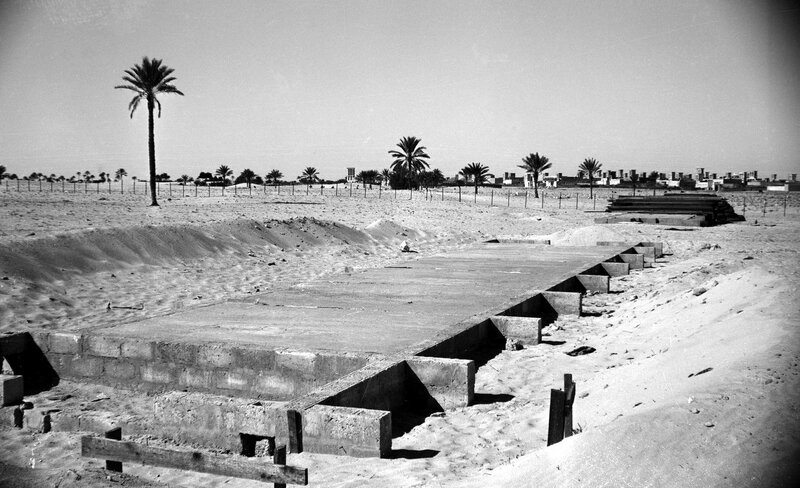 A sizeable strip on the west side of the compound was ceded in 1970 for the construction of a corniche road. 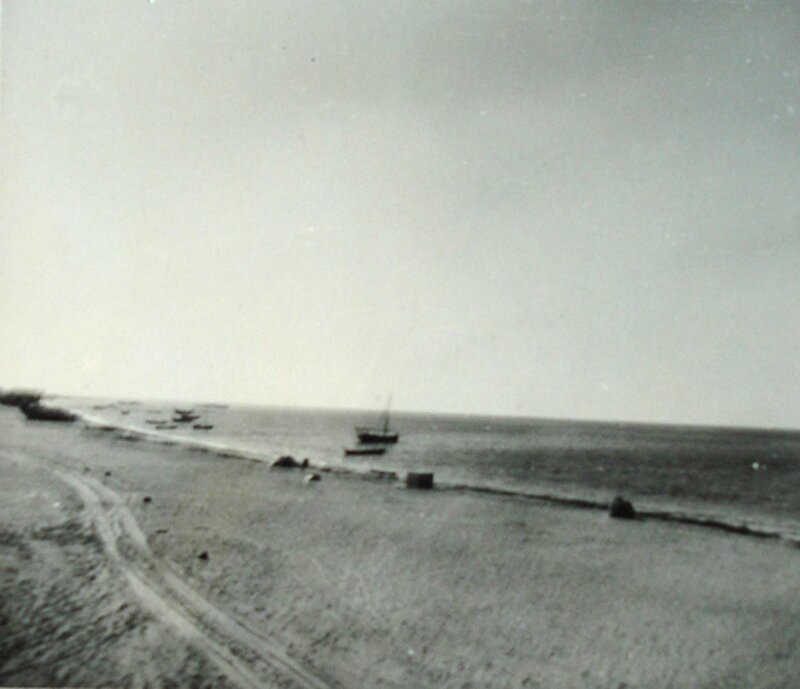 Two pieces of additional land were granted in exchange: a triangular northern extension to the compound, and about a couple of acres at Khalidya, on the sea next to the Decca site five kilometres south, where a new residence could one day be built. When the status of the Post was raised to an embassy in 1971, the residence became inadequate. The proposal to build a new one at Khalidya never bore fruit. Instead, it was built within the compound, designed by John Harris Architects and occupied in 1981 (?fifteen or so years later, tiles from the demolished Muscat Residence were relaid here.) 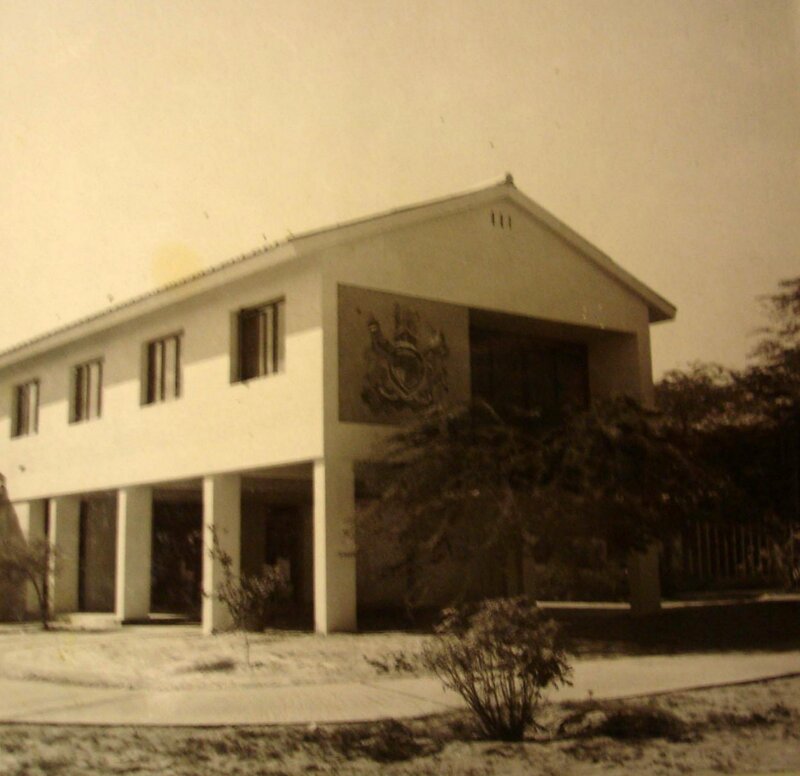 A new two-storey office extension was completed in 1978, followed in the early 1980s by five more bungalows, the conversion of the former residence into two flats, and more quarters for local staff and their families, who have traditionally been housed on the compound. 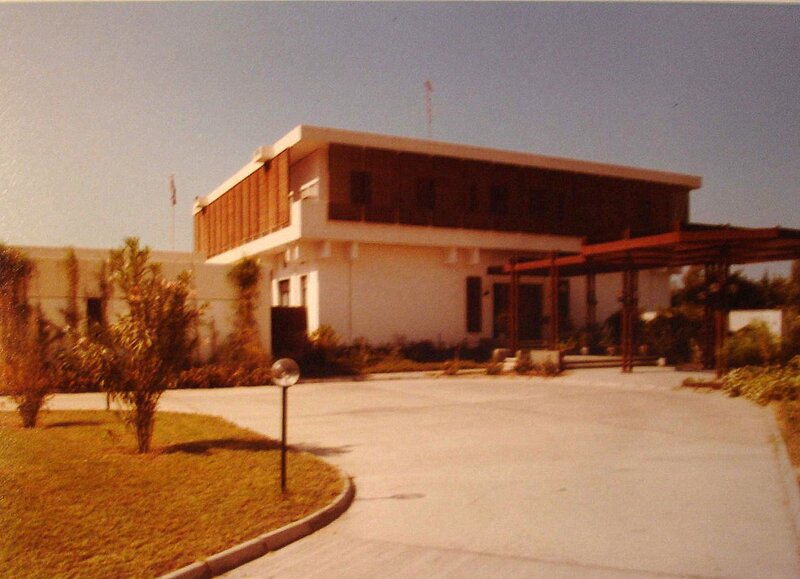 The move to the new residence also enabled out-housed commercial offices to come on compound in the early 1980s. The surplus Khalidya site was returned and a triangular extension to the east of the compound was granted in lieu. 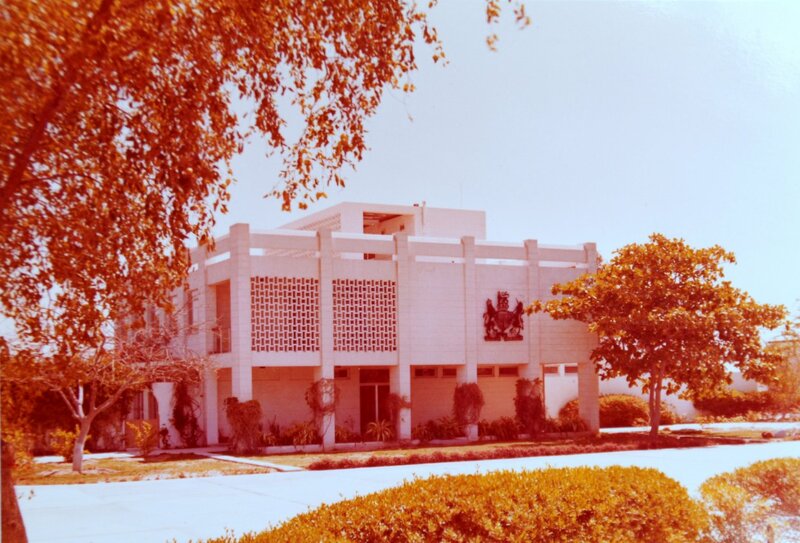 New Administration, Consular and Visa offices were completed near the main entrance in 1993. The present compound, after all the adjustments to its boundaries over the years, now comprises about 9½ acres. 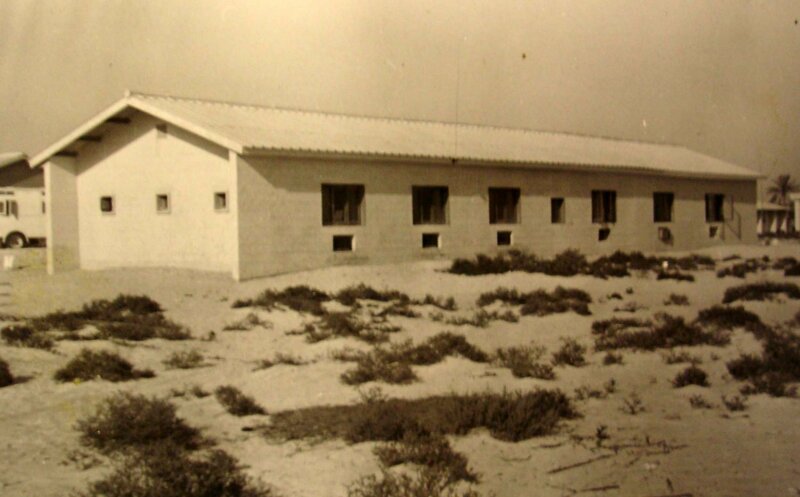 A bungalow was completed in 1971 in the Buraimi Oasis at Al Ain, 80 miles south-east [check] of Abu Dhabi and close to the Omani border, on a site gifted by the Ruler in 1967 for a summer residence for the political agent. The bungalow was later used by staff on a repayment basis when not in use by the head of mission. 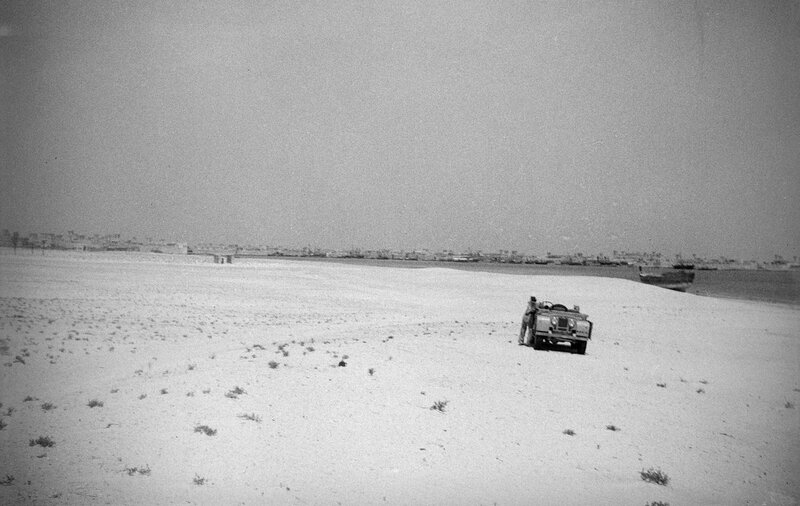 Agency site, looking towards village, 1954. 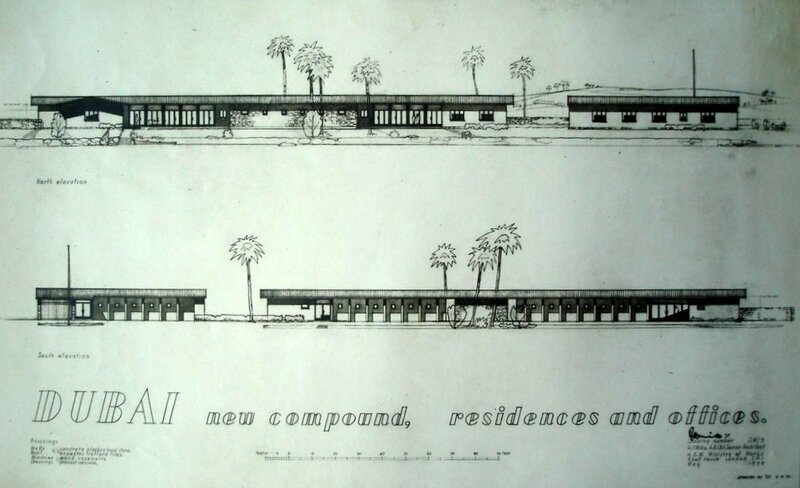 Drawing of proposed agency building., with residence above the offices, 1955. 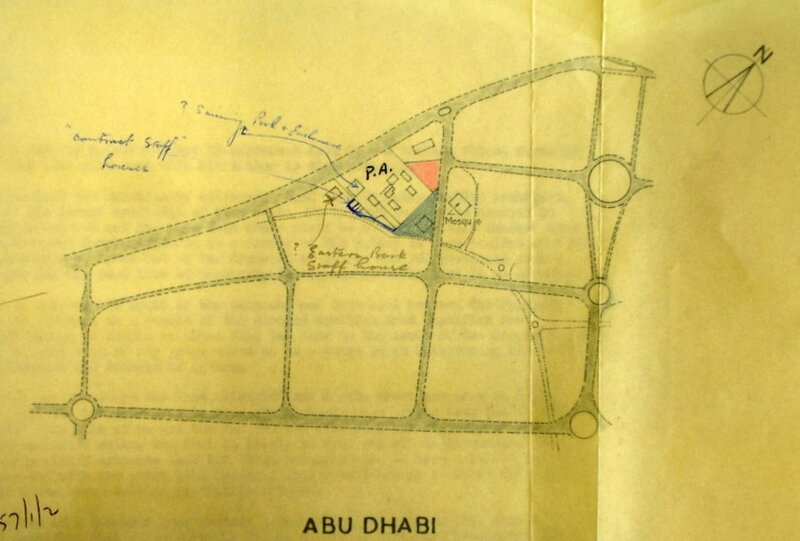 Abu Dhabi compound siteplan, 1970. Green was size after cession of land for corniche road; red was triangle added in 1970; and blue indicates triangle granted in exchange for Khalidya site in late 1970s. Sketch siteplan, 1969 (see caption above for colour code). Site, looking east across creek, 1952. 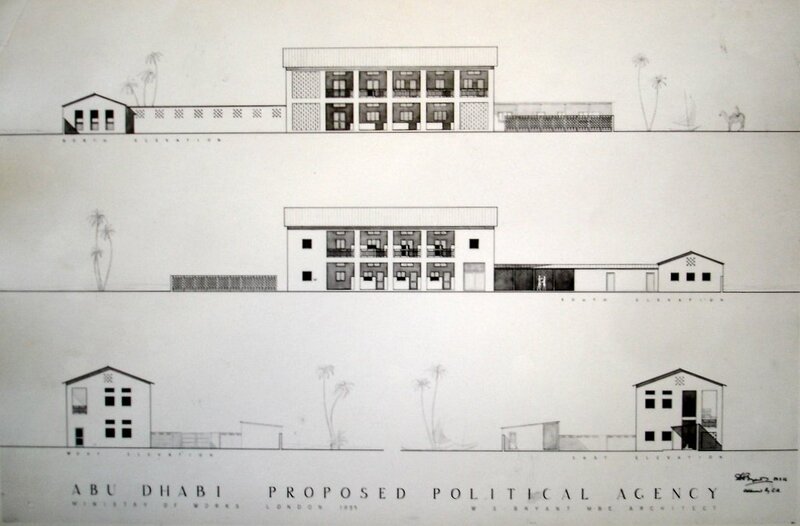 Drawing of proposed agency building, 1948. The arrival of building materials, 1952.